Board Size: 48" x 72"
Ultra-durable, densely woven 6' x 4' magnetic fabric bulletin board backed by high-density fiberboard effortlessly secures documents with push pins or magnets. Delivers superior performance in heavy-use offices and conference rooms. Self-healing surface. 100% Satisfaction Guaranteed. 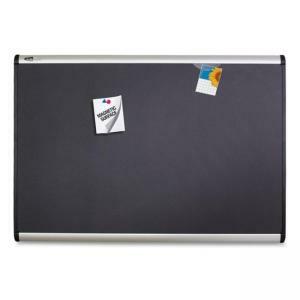 $311Quartet Prestige Plus Heirloom Gray Diamond Mesh Bulletin Board - 48" x 72"
$136Quartet Prestige Plus Heirloom Gray Diamond Mesh Bulletin Board - 36" x 48"
$121Quartet Magnetic Fabric Bulletin Board -24" x 36"